Saiganji Temple was founded in 1590 by the monk Unkai　雲海上人. It belongs to the Jodo sect. Lit. "the Western Shore", the Paradise in the West. It is better known as Aburakake Jizo. One's prayers would be answered if one poured oil over the statue. at Fushimi Momoyama 伏見桃山にある神社, a shrine built by Toyotomi Hideyoshi to protect the his castle in Fushimi. 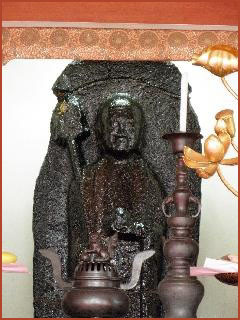 Greasy Jizō or Oil-Covered Jizō. There are various manifestations. 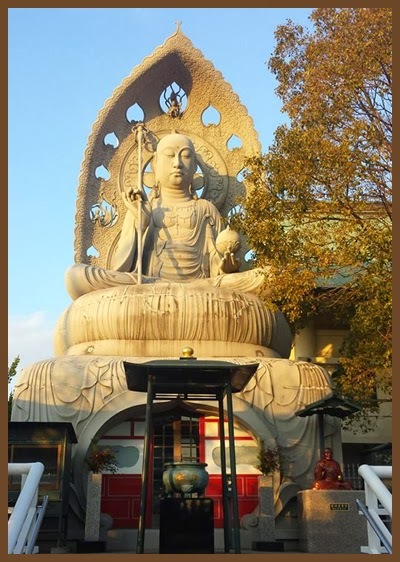 Today, at Saiganji Temple 西岸寺 (a Jodō sect temple) in Kyoto's Fushimi 伏見 district, there is an Aburakake Jizō reportedly dated to the Kamakura period. In olden days, Fushimi was a hub of commerce and trade. "Inbound cargo was unloaded on the wharves at Chūshōjima, then carried by porters another two kilometers into Kyoto. One day, an oil vendor from Yamazaki (a place to the southwest of Kyoto known for its sesame oil) was making his way down Aburakake Dōri [lit. = oil-covered street] when he tripped and fell, spilling his precious load. He scooped up what was left and offered it to this wayside Jizō. Thereafter he prospered, and as word spread of his good fortune, others came to pray for success. 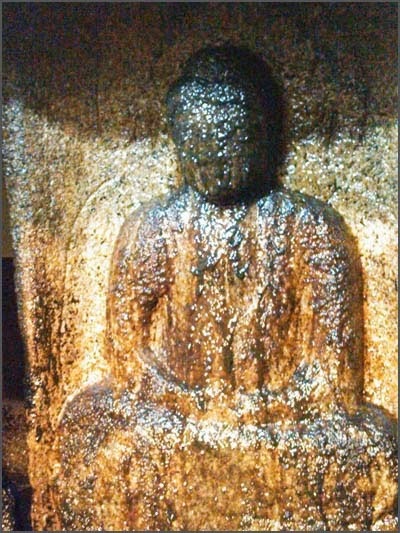 When they achieved it, they gave thanks by pouring a little bit of oil over the image. Today shopkeepers and businessmen continue the tradition of pouring oil over the glistening 1.7-meter-high image, and offerings of ten-liter cans of oil are stacked inside the hall."
. 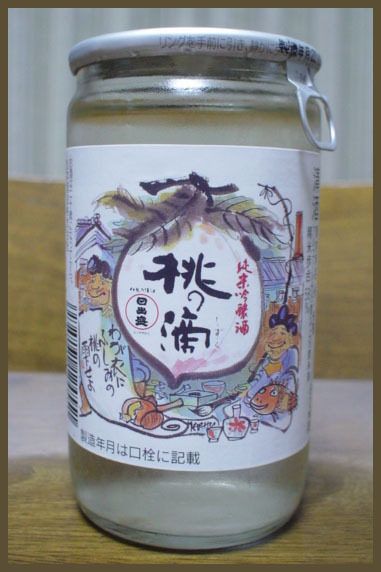 WKD : Yosa Buson 与謝蕪村 in Edo . 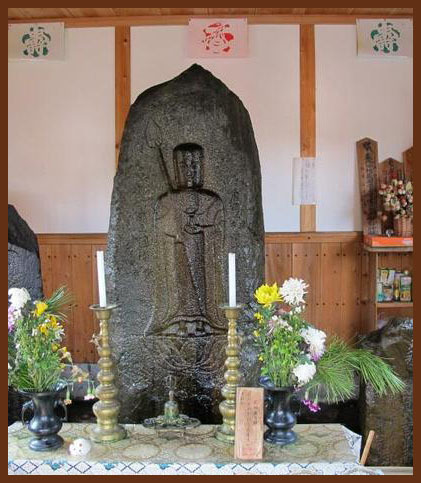 He was the third head priest at this temple during the time of Matsuo Basho, and he was also a famous haikai poet. His teacher was Matsue Shigeyori 松江重頼. Basho, Ihara Saikaku 井原西鶴 and other haikai poets came to his temple to enjoy a poetry meeting. He died in 貞享 3年4月13日, age 81, just one year after Basho had visited him. A greeting hokku to his host Ninko. Priest Ninko lived to a healthy 81 and kept pouring his Buddhist teachings and preachings like drops of refreshing dew on his followers. Fushimi no momo refers to the famous trees planted there, giving Fushimi the name of "Momoyama 桃山" peach mountain. 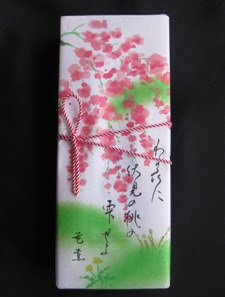 A box with sweets for the Hina Doll Festisval (Peach Blossom Festival). 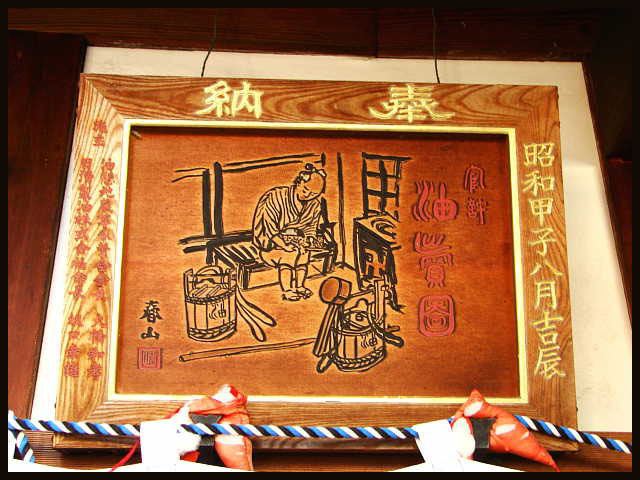 The wrapper shows the hokku of Basho.
. Haiku Sweets (haika 俳菓) . Some drinks with this hokku . . .
. Local Rice Wine (jizake 地酒) .
. Jizo Bosatsu (Kshitigarbha) 地蔵菩薩 .
. Fushimi Inari Taisha 伏見稲荷大社 .